During the build up of World War II, the United States' air forces suddenly found itself with the monumental task of training thousands of pilots needed to fight global war on two fronts in the European theater against Nazi Germany and the Pacific theater against the Empire of Japan. The immediate demand for U.S. pilots was so great that Congress waved the existing prerequisite of two or more years college. As long as you had a high school diploma, passed physical tests and mental exams, you could fly for Uncle Sam. It was also a great attraction to the many young male recruits dreaming of becoming pilots. In December 1942, Ed Scharch signed on as a volunteer recruit and began the first of several training stages to become a Naval Aviation Cadet under the United States Navy Reserve. Following physical exams and intensive aptitude tests, Ed Scharch was accepted by the U.S. Naval Aviation Cadet Selection Board and was sworn in as an AvCad V-5 candidate. Ed's first hurdle was to make it through "elimination school," the civilian pilot training program under the Civil Aeronautics Authority - War Training Service. Some details of the various training stages, schools and curriculum are from articles and personal accounts by other naval cadets and aviators during the war. These details, along with Ed's service records, give insight to his experiences. Classroom only, duration 72 hours. Subjects in mathematical processes, practical arithmetic, geometry, trigonometry and fundamentals of physics. Studies included aerial navigation using plotting boards, aerology, aircraft structures and engines. Naval indoctrination, radio code and semaphore, aircraft and ship recognition. Physical training and drill were all part of the curriculum. Elementary flight training provided by private instructors in Piper J-3 Cub, a yellow high-wing monoplane 2-seat tandem trainer. Flight time was 35-40 hours. Many students soloed with about 9 hours of instruction. Ed successfully completed both parts of CAA-WTS civilian pilot program in 10 weeks. He placed on leave and sent home to await the next opening slot at Naval Pre-flight School. • College courses in navigation with introduction to celestial navigation, aerology, code semaphore, and blinker, recognition, and Naval history were given. • Emphasis was on physical training and bodily contact sports. Cadets were required to participate in a major competitive sport, like football, baseball, wrestling or boxing. Ed Scharch took up boxing, and he even won a few rounds. Ground school only. No actual flight time training. Ed Scharch chose boxing as his contact sport. Duration of 11-14 weeks in six stages. Total flying time of 90-100 hours with 35 hours dual, 55 hours solo, and 10 hours of check ride tests in N2S Stearman 'Yellow Peril' (bi-wing with open cockpit). i. Primary Dual: in company with an instructor - basics of taxiing, take-offs, climbs, turns, spirals, glides, landings, stalls, spins and primary emergency procedures. Upon completion of this first stage, the AvCad performed a solo check flight. ii. Primary Solo: following a general review dual instruction, advanced tasks and techniques. With both dual and solo demonstration, covered in this phase were steeply banked turns, high altitude slips and spirals, spins, wing-overs and reactive emergencies. Instruction included small field landings and slips to a landing, both dual and solo. iii. Advanced Solo: both dual instruction and solo demonstration - loops, split-S, snap roll, pylons, precision landings with slips, spin recovery and field procedures. iv. Final: both dual and solo demonstration - General review stressing smoothness, reaction to strange field procedures with power, instruction in inverted stalls and spins and progressive spins. v Formation: Instruction and practice in formation flying techniques. vi. Night flying: Dual and solo night flying instruction. Ed completed his primary flight training program in 10 weeks, with 2.95 final flight mark. Transition to combat type aircraft with precision work in navigation, aerology, recognition, instrument flying, aerial gunnery, and combat tactics. All carrier pilots trained in the SNJ 'Texan'. Cadets were commissioned as Ensigns and Naval Aviators. One third to half of new naval aviators were selected for carrier training at the end of this training phase. NOTE: No other service records from NPRC beyond Ed's completion of intermediate flight training. Duration of 8-weeks or more with 110 flight hours in operational combat-type aircraft. • Operational flight training was in combat-type aircraft. Typical CV (carrier fighter) aircraft included Grumman F4F, or General Motors FM-2 Wildcat; Grumman F6F Hellcat; Vought F4U, or Goodyear FG Corsair. Flight deck qualifying was on the training carriers USS Wolverine (IX-64) and USS Sable (IX-81) in submarine-free Lake Michigan. at NAS, Glenview, Illinois. • The CV (carrier fighter) bound aviator, before assignment to a fleet carrier squadron, was required to demonstrate their mastery of taking off from and landing aboard a floating airfield. In preparation, aviator students practiced on airfields marked to resemble the flight deck of a carrier with the same landing signals used. • Following this ground training the students were ordinarily sent to the Carrier Qualification Training Unit located at NAS, Glenview, Illinois. Using the available training carriers, USS Wolverine and the USS Sable, the prospective carrier pilot performed the required number of take offs and landings (eight) to be certified as carrier qualified. Pilots were then assigned to operational squadrons. * Ed's accident occurred during carrier qualification training at the end of operational flight training. He and his Wildcat skidded down the deck and overboard into the cold waters of Lake Michigan. His plane sank and Ed remained afloat in the cold waters for several minutes until he was rescued, but not before becoming hypothermic. Ed's plane is one of the 37 FM/F4F Wildcats listed as lost by the Navy during the war. Between 1942 and 1945, there were a total of 200 accidents with 128 aircraft losses and eight pilots killed during training operations on Lake Michigan. Otherwise, there were over 120,000 successful landings and an estimated 35,000 pilots qualified. NOTE: Ed's service records during any operational training phase were not received from NPRC and are presumed lost. He spent time in a military hospital recovering from hypothermia and soar back. He was washed out of the Naval Aviator A-V(N) program and given an honorable discharge. Subsequently, he was drafted back into the Navy as a Seaman Second Class and non-commissioned officer. He served out the remainder of the war stationed at NAAS Waldron Field in Texas performing ground support duties. 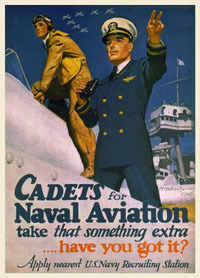 To meet the demand for aviators the Navy created a cadet program similar to the Flight Officer program used by the Army. On April 15, 1935 Congress passed the Naval Aviation Cadet Act. This set up the Volunteer Naval Reserve class V-5 Naval Aviation Cadet (NavCad) program to send civilian and enlisted candidates to train as aviation cadets. Candidates had to be between the ages of 19 and 25, have an associate's degree or at least two years of college, and had to complete a bachelor's degree within six years after graduation to keep their commission. Training was for 18 months and candidates had to agree to not marry during training and to serve for at least three more years of active duty service. Candidates who were selected went on to Naval Flight Preparatory School. This was a course in physical training (to get the cadets in shape and weed out the unfit), military skills (marching, standing in formation, and performing the manual of arms), and naval customs and etiquette (as a naval officer was considered a gentleman). Pre-Flight School was a refresher course in mathematics and physics with practical applications of these skills in flight. This was followed by a short preliminary flight training module in which the cadets did 10 hours in a simulator followed by a 1 hour test flight with an instructor. Those that passed received V-5 flight badges (gold-metal aviator's wings with the V-5 badge set in the center). They were sent on to Basic flight training at NAS Pensacola and Advanced flight training at another Naval Air Station. Graduates would become Naval Aviators with the rank of Aviation Cadet. As members of the Volunteer Reserve, they received the same pay as an Ordinary Seaman ($75 a month during training or duty ashore, $125 a month when on active sea duty, and $30 Mess allowance). After three years of active service they were reviewed and could be promoted to the rank of Lieutenant (Junior Grade) in the Naval Reserve and received a $1,500 bonus. Cadets who washed out of the V-5 program were assigned to Volunteer Reserve class V-6 with the rank of Ordinary Seaman. This was a holding category that allowed the Navy to evaluate the candidate for either reassignment to another part of the Volunteer Reserve or reassignment to the General Service branches of the Navy or Naval Reserve. They were exempt from being drafted by the Army in wartime but were considered Reservists in the Navy and could be called to active service at any time. On April 11, 1939, Congress passed the Naval Aviation Reserve Act, which expanded the parameters of the earlier Aviation Cadet Act. Training was for 12 months. Graduates would receive commissions in the Naval Reserve as an Ensign or the Marine Corps Reserve as a 2nd Lieutenant, and served an additional seven years on active duty. During Basic and Ground School their duty uniforms from 1935 to 1943 were green surplus Civilian Conservation Corps (CCC) fatigue uniforms. Naval Aviation Cadets wore the same dress uniforms as naval officers once they completed Primary. Naval Cadets wore a different insignia than Army Aviation Cadets: a yellow shield with a blue chief with the word "Navy" in yellow letters, a pair of Naval Aviator wings bordered and decorated in blue across the middle, and the letter/number "V-5" in blue in the base. The insignia was in enameled sterling silver for wear on the breast pocket of dress uniform jackets and cloth patch form for wear on uniforms. Graduates received gold-metal Naval Aviator's wings rather than the silver-metal wings awarded to Army Aviators. During the war, the USN pilot training program started to ramp up. It had similar stages as the army's aviation program, except it added a Carrier Qualification stage for fighter, torpedo and dive-bomber pilots. Each graduate had around 600 total flight hours, with approximately 200 flight hours on front-line Navy aircraft. In 1942 the program graduated 10,869 aviators, almost twice as many as had completed the program in the previous 8 years. In 1943 there were 20,842 graduates; in 1944, 21,067; and in 1945 there were 8,880. Thus in the period 1942 to 1945, the U.S. Navy produced 61,658 pilots - more than 2.5 times the number of pilots as the Imperial Japanese Navy. The overall training timeline to prepare naval pilots for combat varied. First three months - CAA-WTS civilian pilot training was in two parts. Part one ground school; included subjects in mathematical processes, practical arithmetic, trigonometry and geometry, fundamentals of physics, aerial navigation using plotting boards, aerology, aircraft structures and engines, Naval indoctrination, radio code and semaphore, aircraft and ship recognition, civil air regulations, physical training and drill. Part two flight school; provided 35-50 hours elementary flying lessons in light civilian aircraft, typically the Piper J-3 Cub. Second three months - Pre-Flight School. No actual flight training. Emphasis on physical training and bodily contact sports. The ground school consists of a review of navigation with an introduction to celestial navigation, aerology, code semaphore, and blinker, recognition, and Naval history. Third three months - Primary Flight School. Advanced flight training with formation and night flying. The ground school is secondary and consists of further study of navigation, aerology, recognition, code and blinker, physical training and drill. Next three to four months - Intermediate Flight School. Transition to combat-type aircraft with emphasis on combat tactics, aerial gunnery, instrument flying and precision air work. Ground school involved precision work in navigation, aerology, recognition, instrument flying, aerial gunnery and combat tactics. At the end of this phase of the training the cadets were commissioned as ensigns in the USNR. Next one to two months - Operational Flight School. Transition to combat-type aircraft. The ground school consisted of individual squadron problems and acquainting the new pilots with combat routine. Carrier fighter (CV) bound aviators were required to undergo carrier qualification training. In preparation, they practiced on airfields marked to resemble the flight deck of a carrier. Carrier qualification was the final phase of Operational training for fighter, dive, and torpedo bomber pilots. Prospective carrier pilots were sent to the Carrier Qualification Training Unit at NAS, Glenview, Illinois. They were required to perform eight take offs and landings aboard one of the Navy's two training carriers located in the submarine-free waters of Lake Michigan. Once certified as carrier qualified, naval pilots were then assigned to operational squadrons.